For the last two weeks we have been talking about the power of appreciation and gratitude. We each have the power to use our internal tuning fork to harness the energy of the Universe. What would your life look like if you could have anything you wanted? You can! The saying, “seeing is believing” or “the proof is in the pudding” are common adages insinuating that something isn’t a success until we see tangible results. That we are somehow helpless in what happens to us in life and have no power whatsoever in co-creating. Science relies on facts and “proof”, but doesn’t it also take faith? The scientist has to believe something is possible first, conducting sometimes thousands of “failed” experiments in the face of real obstacles before exclaiming “Eureka”! Quantum physics has given us some of the most startling examples of just how malleable the Universe is to our thoughts and perception. There are many layers and techniques we can use to co-create, but appreciation and gratitude are in my estimation the most powerful, because they tune your fork toward the energy of possibility. There are four levels of appreciation: physical, mental, emotional and spiritual. When you are able to harness the power of all four, watch out! The sky’s the limit on what you can create. Physical appreciation is two-fold. First, we must appreciate our physical incarnation. We are not our bodies, but if we wake up in the morning, then something is going right with our bodies. By appreciating something about our physical bodies, we have the power to actually change our chemistry. Our cells want to return to homeostasis. Doing mirror work – actually looking in the mirror and saying, “I love you”. “I am grateful for my vision” or other affirmations can have a profound effect. The second part of physical gratitude is to appreciate your surroundings. We often race from appointment to appointment, carting children from practice to practice, losing sight of the beauty all around us. Taking one minute out to appreciate the beauty of a tree, the fragrance of a rose or the sound of a thunder storm brings you into the now moment and raises your vibration. Mental appreciation can be best described as appreciating the vastness that is knowledge and its’ infinite possibility. There is a miraculous world out there. Knowledge is energy and we can soak it up and be open to different perspectives or stay confined in what we know, hanging onto our opinions unwilling to bend or accept new evidence. Being open to all knowledge and perspectives allows you to shift and grow and allow new experiences to come to you with ease. Emotional appreciation can be summed up in two words: Feel everything! Some of us were taught to be “seen and not heard” or “boys don’t cry” or “be brave”. Again, by stilting our emotions, we are closing off the energy and staying stuck. You have to feel it to heal it. Now that doesn’t mean you stay stuck in your story. Remember, the tuning fork. What you focus on expands, so if you keep telling the same story of how “all men leave you”, you are telling the Universe to send men who leave. But denying your emotions or judging yourself for having them keeps the energy physically stuck in your body and unable to move on. In Masaru Emoto’s famous water experiments, he proved that our thoughts and emotions can physically affect our world. Using water collected from the same exact source, at the same time, he had one group of people hold the water and send it love. They infused it with gratitude and appreciation. The other group sent feelings of hate, disgust, guilt and shame to the water. 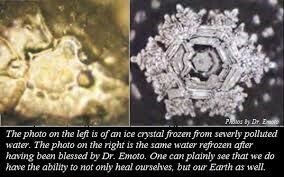 Dr. Emoto then froze the water and viewed the crystals under a microscope. The results were startling! The water that was infused with love and gratitude produced beautiful, symmetric snowflake-like crystals. The water infused with hate and shame produced ugly, dark and sick looking crystals. The same water! Considering that the human body is up to 60% water, you can see the implications of our thoughts and feelings. Finally, we get to spiritual appreciation. Whatever your faith, most of us believe there is something greater than ourselves. Whether God, Creator or Universe, we know we are more than our physical bodies. Appreciating the spiritual realm again allows us to see infinite possibility. Human knowledge has grown exponentially in even the last fifty years and we’ve only touched the surface. Appreciating the spiritual journey can allow you to understand yourself and others at a deeper level. When we put it all together, it comes down to this: Our thoughts, feelings and emotions matter. We can either harness the energy we put out, directing our tuning fork toward expansive infinite possibility, or focus on lack and limitation. We are going to get exactly what we ask for. With what we know today, “Seeing is believing” takes on new meaning. As Wayne Dyer said, “You’ll see it when you believe it”. Belief comes first. Believe you can have whatever you want and it’s yours. 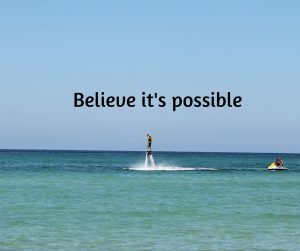 What do you choose to believe?